Animals without proper oral care often begin to show signs of mouth disease later on in their life. Oral disease can lead to serious problems. Keep reading to learn how to properly care for your pet's mouth. The right meat based diet for your dog or cat can help keep the inside of the mouth healthy and plaque free. You can also purchase other dental friendly foods like Purina DH Dental Health Canine Formula for dogs or Purina Veterinary Diet Feline Dental Health for cats. There are oral treats for dogs like Get Naked Gut Dental Chew Sticks that can also help. Chew toys and the like can do a lot to keep a dog's teeth clean. Gnawing on the right chew toy will scrape away any soft tartar and massage your dog's gums. Raw bones, toxin-free raw hide, or rubber chew toys should do the trick. One of the most important parts of keeping a pets teeth clean is keeping its teeth brushed. To do this, get a teeth cleaning kit like Petrodex Dog Dental Care Kit for dogs or Petrodex Dental Care Kit For Cats. Start when your pet is young to get him used to getting his teeth brushed. Begin by massaging the gums to get your pet used to the feeling. 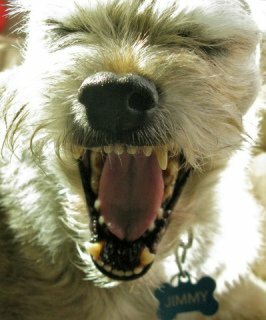 Once your pet seems accustomed to this, introduce some pet safe toothpaste. First, put some on his lips so he gets used to the taste. Afterwards, you can introduce the toothbrush and brush his teeth gently with the toothpaste. 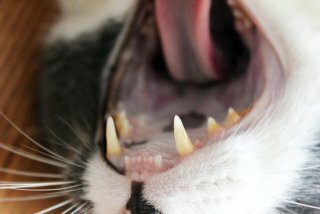 It's a good idea to monitor your pets breath. While no animal's breath is going to smell wonderful, extremely bad breath may be a sign of oral or other health problems, and it may be a good idea to get your pet examined by a vet. Check for signs of bad oral health at least once a week to prevent any further health problems. Do this by making your pet face you. Lift up his lips carefully and examine his teeth and gums. The teeth should be clean without any brownish tartar, and the gums should be a healthy pink. If gums are red or white, or show signs of swelling, there could be a problem. When you check your pet's mouth, it's important to know what to look out for. Any of the following might be signs of a problem. Gum tumors or tumors in the mouth. If you see any of these signs, be sure to take you pet to the vet to get them taken care of.